Construction of the Great Aswan Dam on the river Nile had posed grave danger of submergence to many ancient Egyptian-Nubian temples, monuments and archaeological sites. To preserve these archaeological heritage, UNESCO had launched a very ambitious programme of rescuing these structures by dismantling and relocating these to a higher elevation and had made an international call to for financial/technical assistance. As a sign of gratitude for the help provided by various countries in saving the temples including those of Abu Simbel, the Egyptian Government donated four small temples for relocation in some of the major donor countries. In this post I am giving important features and few images of these relocated temples. 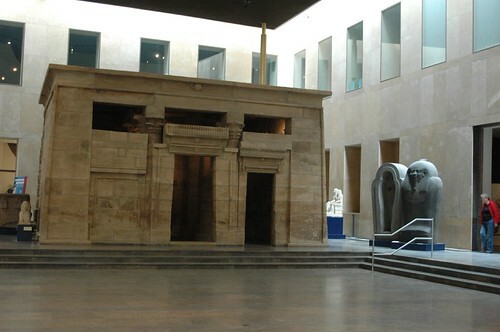 Temple of Taffa relocated in Leiden, the Netherlands. The temple was originally located about 15 km south of Aswan very close to the great religious center dedicated to the goddess Isis, in Philae. It was constructed in early 2nd century BC and dedicated to god Amun. It was extended during the reigns of Ptolemy VI, Ptolemy VIII and Ptolemy XII to form a small temple, 12 x 15 metres and was dedicated to goddess Isis. Later the Roman emperors Augustus and Tiberius added some decorations in it. 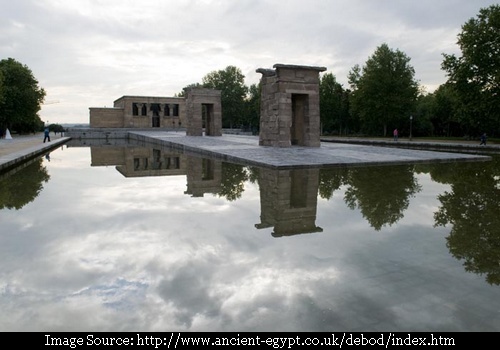 As a sign of gratitude for the help provided by Spain in saving the Nubian monuments/temples, the Egyptian state gifted it to Spain in 1968. 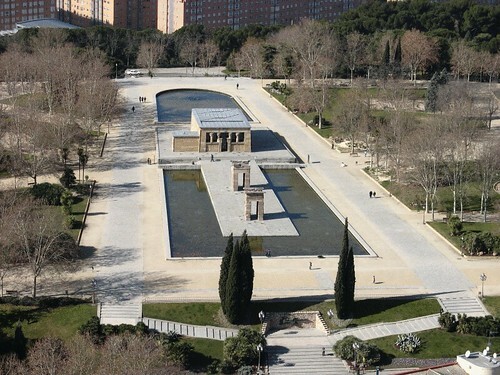 The entire temple complex was carefully dismantled, in about 1300 stone blocks, and transported to Madrid where it was rebuilt in one of Spain's most beautiful parks, the Parque de Rosales, near the royal palace of Madrid, and opened to the public in 1972. Image copied from ancient-egypt.co.uk - A web site about ancient Egypt created and maintained by Simon Hayter. 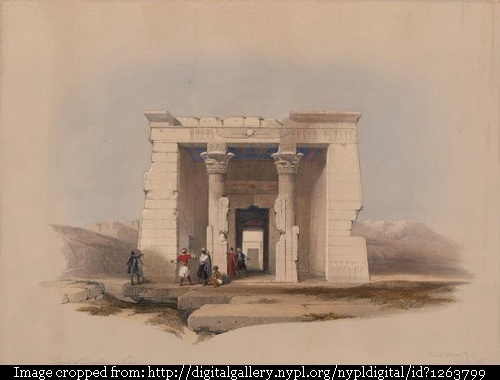 The temple at Dendour (aka Dendur) was originally located about 80 kilometers south of the town of Aswan. 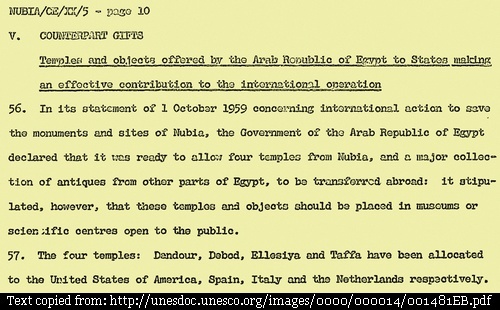 The temple was dismantled in 1963 and in recognition of the American assistance in saving various other monuments threatened by the Great Aswan Dam's construction it was gifted by Egypt to the United States of America in 1965. Jacqueline Kennedy Onassis was amongst those who received the gift on behalf of the US government. 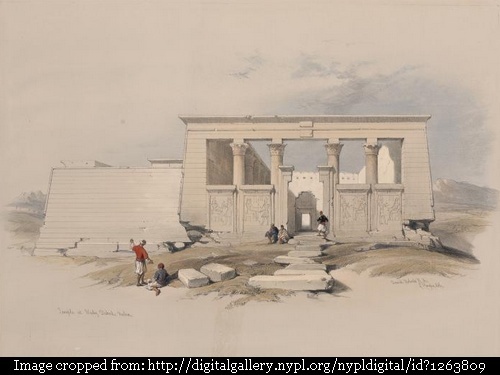 The original temple was built around 15 B.C. during reign of Augustus Caesar. It measured about 24 metres from gate to rear of temple. The dismantled stone blocks of the temple weighed more than 800 tons in total with the largest pieces weighing more than 6.5 tons. They were packed in 661 crates and transported to the United States. Initially it was proposed to re-erect the temple on the banks of the Potomac River in Washington, D.C. or on the Charles River in Boston. However, these plans were shelved as it was felt that the temple's sandstone may not withstand for long the outdoor conditions. 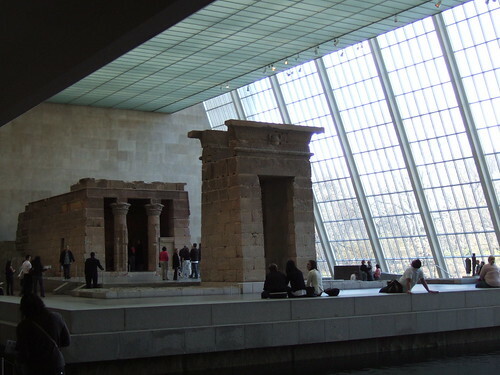 Finally on April 27, 1967, the temple was awarded to The Metropolitan Museum of Art, New York, where it was installed in the Sackler Wing in 1978. Keeping in view the terms of the gift entry to the temple is free. Temple of Ellesija (aka Ellesiya) - a rock hewn temple, was originally located some 225 kilometers south of Aswan between the first and second cataract of the River Nile. It was built by Pharaoh Tuthmosis III in the fifteenth century BC. 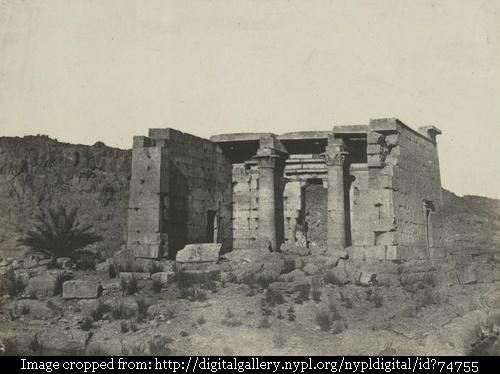 The temple was already partially flooded by the waters of the older (first) Aswan Dam, built in 1902 and many of the wall relief works were damaged. As a part of the UNESCO plan it was salvaged and saved from total submergence. 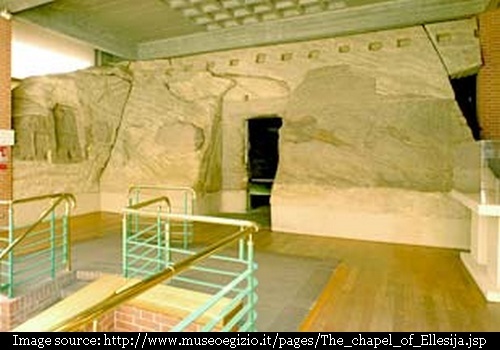 In 1966 the monument was donated to Italy by the Egyptian government and was re-installed in Museo Egizio (Egyption Museum) in Turin, Italy. 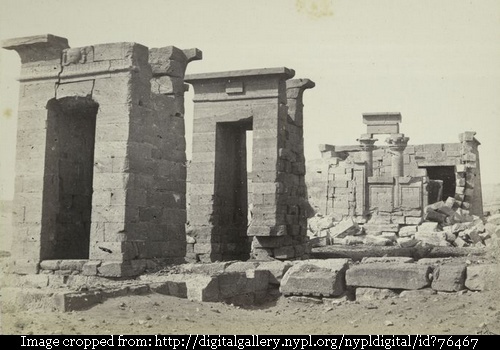 The Temple of Taffa (aka Taffeh) was originally built in Taffeh, Egypt, in the early Christian era between AD 1-14 on the orders of the Roman emperor Augustus. It was part of the Roman fortress known as Taphis and measures 6.5 X 8 metres. Initially, it was devoted to the goddess Isis. Later it served as a Christian church. It's nice to have a photo of mine used on your excellent site.